The GARDEN STAR LED – Laserworld GS-100RGB LED is a red-green-blue laser light effect combined with a strong LED in one unit. The GARDEN STAR LED is well used for indoor and outdoor applications and features impressive LED background illumination. Hundreds of fine, clearly visible red, green & blue laser dots illuminate trees, plants and buildings at a large scan angle or draws attention at every party, even at Halloween, Christmas, etc. The colors of the laser as well as the colors of the LED can be controlled by a radio remote control. The GARDEN STAR LED has a durable and IP65 waterproof aluminium housing, what makes it particularly suitable for effective lighting in gardens, at ponds, pools, on balconies and outdoor areas. 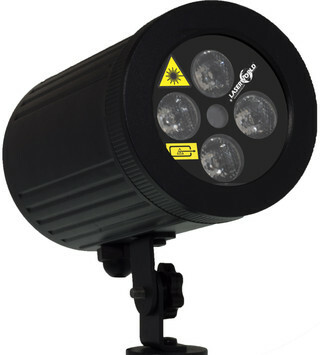 The GARDEN STAR LED – Laserworld GS-100RGB LED has an output power of up to 100 mW (laser light) and 4 x 3 W (LED).